“I want to play a pivotal role in updating and sharing community generated information with the community and the world at large through citizen journalism. I say so because I witnessed an incident a few months ago during the oil shortage problem, where a CNN journalist came to Kibera slums and paid a woman stage manage some kind or a demonstration saying the price of Paraffin had gone up as he recorded her. I would like to know more about www.voiceofkibera.org so that I can challenge the perceptions and misrepresentations that Kibera goes through.” This was what Ann one of the participants had to say during the introductions session at the meet-up. Before then, Map Kibera Trusts’ Voice of Kibera had organized a presentation in Soweto East village to engage the youth group leaders more on how they can get engaged with the platform. Having invited 30 representatives, 22 were able to turn up for the event that started at about 2:15pm on Saturday the 1st of December. Adequate arrangements by the V.O.K team were made to ensure that the days program would run smoothly hence achieving its purpose. Below was the program flow. 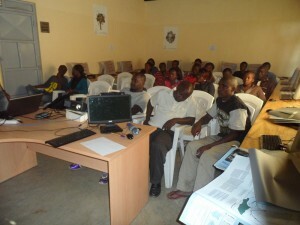 Introduction of the entire Map Kibera Trust and Voice of Kibera. The relationship between Map Kibera Trust programs. 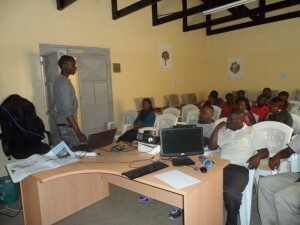 The Voice of Kibera platform and how it works, what the participants think can be improved. Question and Answer time to enable a brain storming session for better understanding. Distribution of Maps on 3 themes; Education, Health and security to the line organizations that attended. This was a step by step presentation done with Fredrick, one of the Map Kibera trust members. I could feel the mood in the hall, one with silence meaning the participants were keenly taking in what was being said. Some of the details that were shared are; How to submit a report, The ways with which you can send the report to the website, the details and importance of categories, editing, proof reading and approving or reports among others. After the session Sande took over to reinforce what had been discussed even as he led the question and answer time. How do you ensure authenticity of the reports you collect? Now that we have new boundaries, what is your organization doing to that effect? Do you have anywhere you advertise jobs for the youths in the slums? That when you have a report and you are not sure about its’ contends, you can get call back the person who send it to get more clarification, if the news has been covered by a 2nd or 3rd parties you can use that as well as using your available networks to get confirmation or more information on the same. Map Kibera is currently remapping the new boundaries by IEBC including information on the location of polling stations so that this information can be available to the locals before the elections in March 2013. We are developing a plartform under the name organizational directory that will see advertisement of opportunities a reality in the sense that those who consume contend do it for free apart from profiling organizations in Kibera on the Platform. 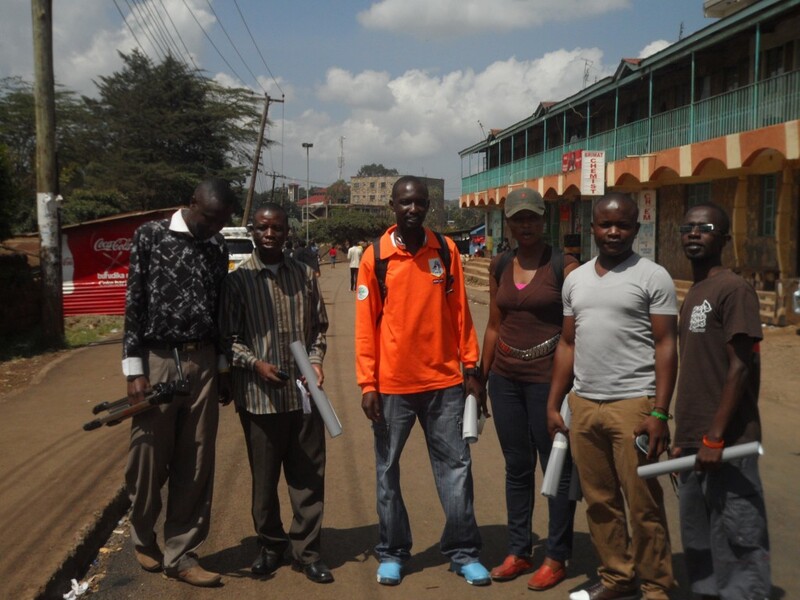 Having been the first organization to put the entire Kibera slums on the world map, Map Kibera Trust; an organization that seeks to be a hub where access to open information contributes to positive community transformation was on the road again to ensure that the maps that were produced reached the community which in-turn would put them to use. To achieve this, the program coordinators met for the preparation of distributing the maps; there intention of meeting was to bring the attention of the three programs on how they will be working together towards achieving the objective of the exercise and to come up with relevant locations for maps distribution. It was there that they agreed that members from the 3 programs; Mapping, Voice of Kibera and Kibera News Network were to go to the field to distribute the maps which had been developed based on themes. Maps on Education, Security and Health are the themes that were distributed. 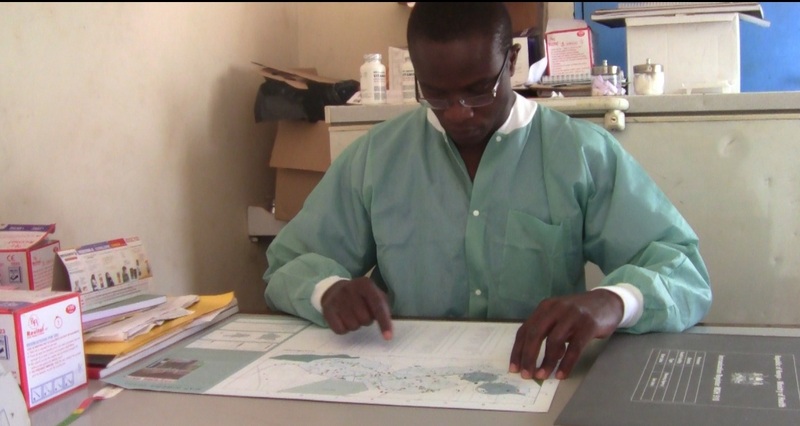 The aim of the exercise was to give back to the community through the high quality printed maps that contain the informational that came from them during the first phase of the mapping exercise. For the 2 days that we were in the field, we were able to cover all the 13 villages; Gatwikera, Raila, Olympic, Soweto west&east, Kianda, Kambi muru, Kisumu ndogo, Lindi, Mashimoni, Makina, Silanga, and Laini Saba. Positive Feedback From the Field. As we visited different places, we collected feedback from the people we found so that we could ascertain how the maps will be put to good used. The local administration appreciated our work and accepted to be interviewed i.e. Sarang’ombe and Laina Saba ward chiefs. Most of the institutions accepted to use the map for positive transfiguration most of the institution wanted more than one map so they can use it for informational purposes as well as Education especially the Schools we visited. We even had a chance to meet with D.O 1 (District Commissioner) who had a compliment for us saying that our map was outstanding compared to the one they had before. For those who were not able to access our maps online were able to access them on hard-copy something that was important for us since it was now realized. 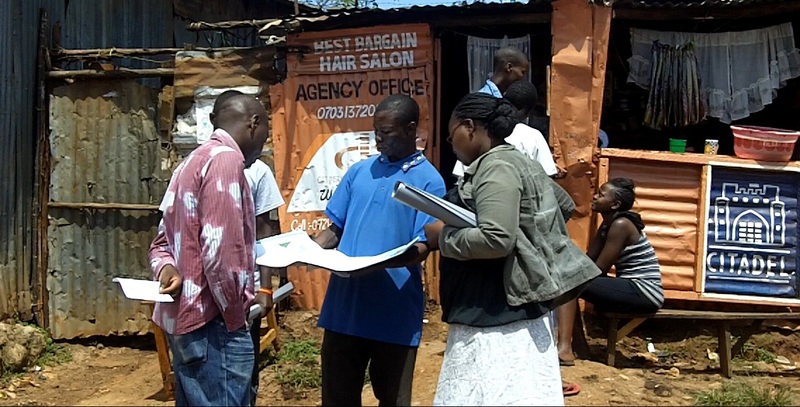 We ensured equal distribution of maps in at least all villages in Kibera. Though most of the places we went to were very receptive, we experienced some hostility in a few areas where we were thought to be a different group out to just take advantage of the situations in Kibera by walking around to talk to people as we take photos to go and sell. After a few minutes of sharing our intentions with them, they understood us and we gave out the maps, something they congratulated us for showing a good example to organizations by sharing the findings of the work done with the community. We also found some schools that were to get maps already closed for holiday which means we will have to give them the maps when they resume school. In general, the exercise was a success only for the schools that had already closed. Going forward, we need to print big and more visible maps a suggestion that came from one of the places we visited. We hope that the maps distributed will not only be put to good use but also help Map Kibera Trust bond more with the community so that even as we get ready to cover the vents before, during and after the elections, we can work together to achieve optimum results and that Kibera and the other slums we are currently working with (Mathare and Mukuru) will never be the same again. Thank you for sending in the link on time and tagging it correctly. I just watched the video – love the narration and the background music. However the music and the sound suddenly goes off in the middle, and as per the submission guidelines the video cannot be longer than 10 mins . Please cut down on the video length, other participants also asked me if they can make a 13-15 minute video – and I had to say no. Simply edit those segments, looking forward to your updated video by tomorrow night. This is a message we get from Nilofar after hurriedly submitting our video “From Wild To Digital World ” for the Digital Natives video contest. The message was referred to John Musila, one of the KNN members that we had suggested to be the contact person during this contest. The message was demoralizing as time was not on our side. We had one month to work on the video but were still busy doing some other things, though we registered in time. The contest required us to first write a proposal elaborating on what our video will be all about after reading and choosing a topic from one of the four books available online. We did all that and later got an email that our proposal was approved so we qualified and could go ahead and make a video that would be enrolled for competition. It was only two days left to the deadline of submission of the videos, we had hardly started working on it, the previous two days we were very busy filming the Butterfly Works Project, so we were done and were now ready to work on this DN video before the deadline ends, only to realize that the footage we had saved on the hard disk for the video could not be used anymore, the hard drive had crashed, so we were stuck. How will we start filming everything again and edit within the short time remaining? we thought, at some point we were stranded, but we could not afford to let this chance go, come on, we must do something, we all had the same spirit. “Call Kepha, the Director, to help us fix the hard disk” someone suggested, yes I called Kepha, but this would take sometime before it is fixed and we will miss out the chance. “Hey guys lets go and get new footage, we can’t sit here and wait for Kepha” I said, then we quickly divided ourselves, Joe and Eddie were going to get footage of the Ngong forest and some shots of schools and hospitals, while Jacob and I were taking Mildred out to the field for mapping interviews and some more cutaways, Steve and John would remain back for editing, and off we went. Back to the office we noticed that we needed an interview from a member of Voice of Kibera to make our story complete, luckily enough Sande appeared then we quickly set him up for an interview which was successful. The program was so tight that we had to do everything the same day, because the following day was the deadline, we then took Steve down to the railway line to let him talk about KNN, the tripod was so disappointing but we managed with it then rushed back to the office, now I was to go outside with Jacob to do the narration as Steve was previewing the shots we had taken so far, as we wait the shots from Joe and Eddie. Time check 2pm Joe and Eddie brought the footage and editing started, by 8pm Steve was done, the video was ready for consumption, so we left it uploading overnight. Coming to the office very early the following morning, to check if our video was uploaded, I met a big message on the screen, “sorry the upload was interrupted due to internet interruption” I had to start afresh. The uploading process also became a nightmare, it could get up to 82% then stops there, but after trying three times without success, we almost gave up, then we decided to use a different computer which finally worked. We were happy after sending the link to the DN, little did we know that we still had a lot to correct, the message in the first paragraph surprised us, we went back to the time line corrected the video and resent it, then quickly got a response from Nilofar that it was better now and that he loved it. We were now relieved, I personally felt as if I had just walked out from a prison cell, I was a free man again after a very busy working week. Before we submitted the video we called Kepha to view it and comment, “this is a winning stuff” is all he said, we were happy considering how hurriedly we worked on it, we had high hopes of winning, we mobilized our friends on Facebook and Twitter to vote for our video which they cooperatively did, the votes from the public alone were not going to determine the winner, there was a panel of judges to also watch and decide the top two winners. Am happily writing this blog after the announcement that we were the top position, with over 10000 votes, followed closely by Marie a lady from USA with 9000 votes. We have won a prize of 500 EUROS, I must say thanks a lot to everyone that helped us make it through, those who voted, those we interviewed the Digital Natives Staff, the Jury, all KNN members for a wonderful cooperation and Map Kibera Trust at large for the this great platform to exercise our skills. You are currently browsing entries tagged with Map Kibera Trust at Map Kibera.